Born in 1966 on “The Blood Reserve” – ​​an Indian reservation in Southern Alberta, Canada. He grew up in the Blackfoot tribe with his grandparents. 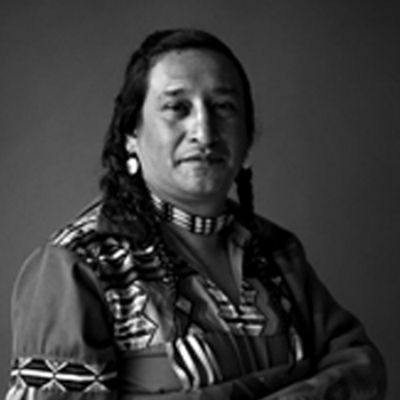 They were of the older generation and lived in the traditional way, where also the oral tradition of knowledge and mythologies was an important part – that is why Pablo possess a very great historical and practical knowledge concerning the Prairie Indians’ original way of life, and like his grandparents he is an excellent storyteller. "PATH OF THE BUFFALO - MEDICINWHEEL"
This is a very unique and exceptional oral transcript based on ancient oral traditions of the Blackfoot Indian ways. It is easily understood and contains examples from daily life combined with various diagrams of the teachings of the medicin wheel to meet the modern thinking people of today. 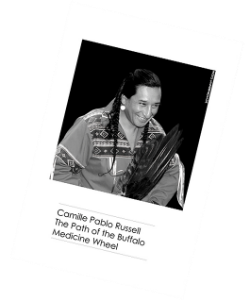 The book can be used as a handbook to self-healing, to get insight in ancient knowledge and also as a book that serves to support a deeper understanding of Pablo Russells lectures and workshops based on the principle of “Following the Path of the Buffalo”. "I had the great pleasure of participating in a sweat lodge ceremony with the Blackfoot indian Pablo Russell in May in Bredsten, Denmark. It was an extremely intense experience to sit sweat-dripping and very packed in the dark listening to Pablo’s calm voice and insightful messages, followed by drums and Indian songs; it mentally took me back in time to the North American plains - surrounded by tribal members. Pablo has together with his Danish and German sundancers created a loving and welcoming environment where I felt very welcome. It is an experience I can warmly recommend other adventurous and spiritual seeking people". Going into the sweat lodge ceremony was a very powerful experience. Right from the start of the ceremony I felt very welcome and part of a larger community. During the ceremony Pablo managed to create an atmosphere where we all felt safe, secure and able to get help needed for the process, each of us was going through. At the same time Pablo had a deep respect and empathy for the individual. Sweat lodge ceremony has helped to balance and relax me and I managed to let go of some old patterns and emotions that I no longer need. Likewise I have got a better connection between myself and Mother Earth. After the ceremony I felt cleansed, very tired and somehow new born. Thanks for a wonderful learning and good experience. I highly recommend Pablos sweat lodges to anyone interested in personal and spiritual development.